Medacta Corporate | HIP REPLACEMENT. WHY TOTAL HIP REPLACEMENT? A hip prosthesis is an artificial articulation composed of a femoral stem with a head (sphere) and a socket cup (acetabular shell and liner, if any). The femoral stem is made of metal (usually a Titanium alloy or stainless steel). The head is made of ceramic or metal. 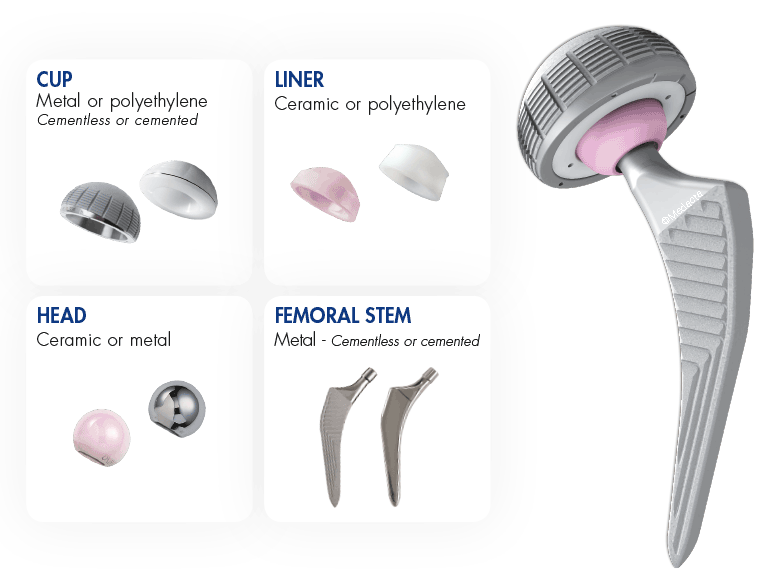 The cup is made of 1 or 2 pieces, depending on the procedure: cemented (usually only one component of polyethylene) or cementless (metallic acetabular shell and liner). In the case of a metallic acetabular shell, a polyethylene liner articulates against the head. All the materials used for hip arthroplasty are highly biocompatible. With almost 70 years of history, total hip replacement surgery is a very common and safe procedure for the treatment of severe arthritis. Your hip may function with less effort, almost regaining your original mobility.